Newdelhi:1/11/18:The two-day long preparatory meeting of the “Shanghai Cooperation Organization Joint Exercise on Urban Earthquake Search & Rescue- 2019 began here today. This marks the first phase of the main exercise scheduled for 21-24 February, 2019 in Delhi by India. The National Disaster Response Force (NDRF) has been entrusted with the responsibility of organizing the exercise by Government of India. 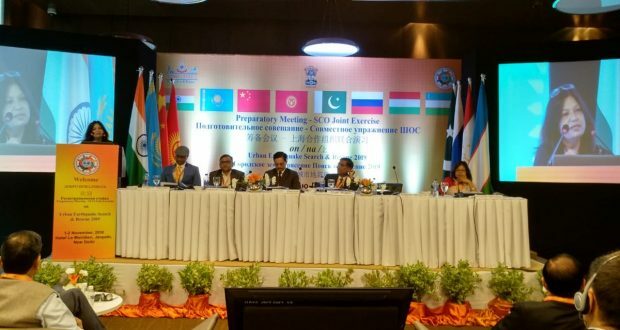 Delivering the keynote address, Shri R. K. Jain, Member, National Disaster Management Authority (NDMA) said that in the 9th meeting of the Heads of Departments of disaster prevention of SCO countries of Shanghai Cooperation Organization (SCO) member states, led by Union Home Minister, Shri. Rajnath Singh, held at Kyrgyzstan in August, 2017, India volunteered to organize the “Shanghai Cooperation Organization Joint Exercise on Urban Earthquake Search & Rescue- 2019 for the region, accordingly today’s meeting is being conducted. Shri Jain also highlighted the increasing trends of disasters especially hydro-metrological disasters in the region. As all the countries are interconnected with each other, hence action in one part of world affects the other part. He further said that the challenges in disaster management are common in the world. If we are able to prevent and reduce the impact of disasters, it will be a huge global benefit. Shri R K Jain added that India has always been at the forefront of the Disaster Risk Resilience (DRR) efforts by hosting the South Asian Annual Disaster Management Exercise (SAADMEx), Asian Ministerial Conference for Disaster Risk Reduction (AMCDRR) and Bay of Bengal Initiatives for Multi-Sectoral, Technical and Economic Corporation (BIMSTEC). He said that the preparatory meeting will be helpful to chalk out the plan, discuss requirements, details and modalities of main exercise, which is scheduled for February, 2019. The exercise will be based on INSARAG guideline, he added. Ms. Rajni Sekhri Sibal, Additional Secretary (DM), MHA highlighted on sensitization about the dimensions of disaster and responsibility of SCO. Ms. Madhumita Hazarika Bhagat, Joint Secretary (SCO), Ministry of External Affairs (MEA) underlined the uniformities of disasters in the region and emphasized the need of effective coordination among the member nations for unified response. Welcoming the august gathering, Director General, NDRF, Mr. Sanjay Kumar said the types of events, modalities, venues, protocol and requirements would be worked for smooth conduct of main exercise during the course of this two-days Preparatory Meeting. DG, NDRF, further added that the simulation exercise will provide an opportunity to practice and strengthen the national and international response, coordination protocols and methodologies, in a major earthquake scenario requiring international assistance. Representatives from all eight member countries namely the Republic of India, Republic of Kazakhstan, the People’s Republic of China, the Kyrgyz Republic, the Islamic Republic of Pakistan, the Russian Federation, the Republic of Tajikistan and the Republic of Uzbekistan attended the meeting, addressed the audience and shared their introductory remark. The meeting was also attended by the officials from NDMA, NIDM, MHA, MEA NDRF as well as from various central ministries and stake-holders. The meeting will be continued for tomorrow.